An accent wall is one of the most popular features in the world of interior design, as it allows a homeowner to infuse a space with a dash of color without washing the entire space in the same hue. This style works particularly well in washrooms as a way of unifying the look of bathroom accessories and bathroom vanities into a streamlined aesthetic. No matter what design scheme you're going for, an accent wall can help to blend your decorative additions with ease. Go with a paint color that you'd be comfortable pairing with your shower curtain, towels and other accents that you'll change frequently. Wallpaper is another consideration for your accent wall, and there are countless designs to choose from that could revitalize your space. Fabric wallpaper is a wonderful option, and its ease of installation and removal could allow you to change it once a year! Wall color is a major consideration during your bathroom design project, and it can dictate the overall feel of the room. 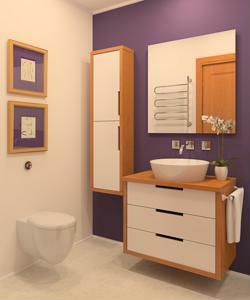 What color or style is your ideal choice in a washroom?